I had to do dishes tonight. They were scattered across the counters and the stove top. I know some people are appalled that I don't wash dishes after every meal but I just never got into that habit. It was more important to me to spend time after dinner with my family than to stand in the kitchen with my hands in soapy water trying to Brillo out the burnt on tomato sauce from the corner of a baking dish. So they would sit. Plus, I feel it's really wasteful of water to wash when, in the morning, I have only a bowl and a spoon. If I do some cooking or baking then yes, I'll usually clean up but if it's soup or just leftovers, meh. I'll wait until I have a couple of loads. Of course, dirty dishes metastasize into taking over all available counter space, but at least I know I'm doing full loads. What a better way to accompany dishes than to stitch. Plus, I got a bunch of newspapers read and my lap was available for sitting. Another large leaf was finished. 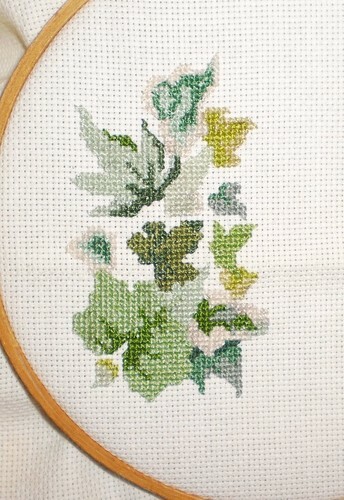 I'm getting close to having to move the hoop to finish this line of leaves.